GoodWork is the absolutely ultimate theme for your business! It is an elegant & modern solution packed up with an incredibly great amount of high quality features. Shortcodes, sliders, layout builders, theme options, page templates, multilanguage support, responsiveness and retina ready, etc., are all in here! Beautiful outside backed by a great framework and supported by professionals, this is the all in one WordPress solution for your business!! With support for great plugins such as Ignition Deck & WooCommerce it really stronger, allowing you to build an awesome portfolio, presentation site or online shop altogether! 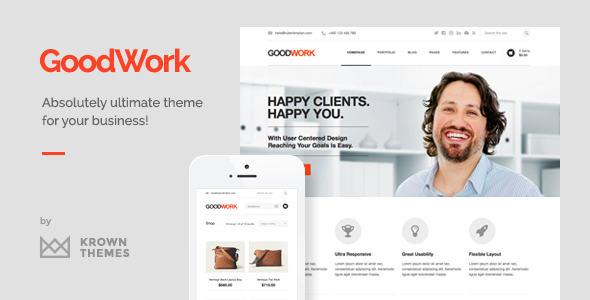 With over 1000 hours of hard work & brainstorming invested in the theme, GoodWork is one of the most powerful and complete WordPress theme on ThemeForest! We do not offer refunds for our themes, except when you find a real bug which we are unwilling to fix. Our themes function exactly as we advertise them, so no refunds are given for reasons such as mistake purchasing or customization problems. Check out the documentation before you buy! Video: How easy it is to get started! Not only did you create a fantastic design with some really simple customization options (Customize and Theme Options), but you packed it with the best slider I’ve ever used and Visual Composer, which allows people to design pages with no coding knowledge. Am loving the documentation, FAQ, helptickets etc. am not a whiz but with all this documentation am certainly able to make it work just as I want it to. Awesome stuff! Thanks for your awesome customizing work! based on your goodwork theme we can create the best site in our market. All the best for your sales, your are a real coding ninja !! Great work! Never worked with wordpress this good as with your theme. It’s really powerful and well documented. Goodwork is an amazing theme and by far the best we’ve ever used/downloaded. The only theme I’ve ever been able to use to actually create a site the exact way I want it. Great look and feel to everything and highly recommended to all, particularly for the low cost and fantastic support available. This has been an absolute treat of a theme to work with. The documentation and ease of use with the theme you’ve built absolutely rocks. Brilliant. Best web theme I’ve ever used! Found the visual composer, and that bit blew me away! Insanely good! Wow!! This theme looks insane! This theme has an elegant & minimalistic design, with a lot of unique touches. It is based on a four columns grid providing both classic & modern types of layout and page templates. It is totally responsive, meaning that it will look good on all kinds of mobile devices. The sliders have touch events enabled & the entire content is scaling properly down to the smallest size. All the images in this theme will look sharp on devices with a high DPI. If you provide large sizes, when a user opens the site in a retina device a cookie will be stored on his device and after the first refresh all images will look really good! 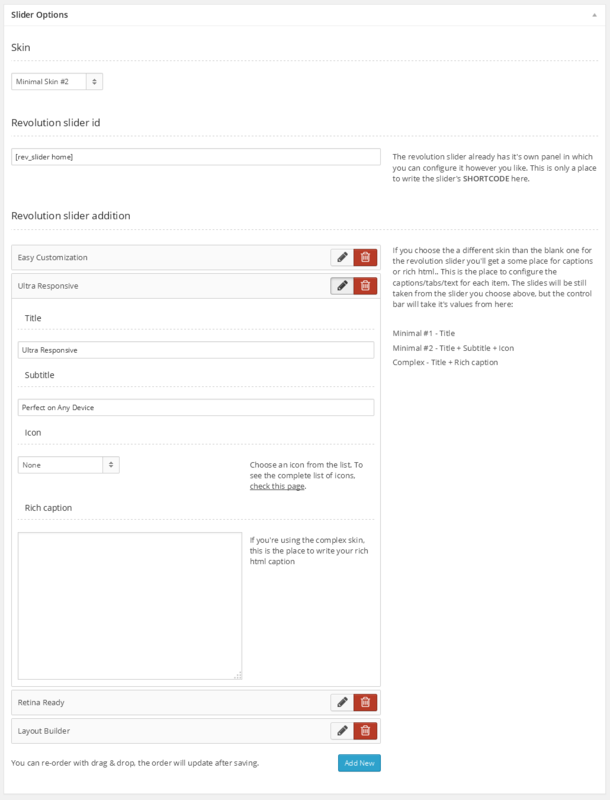 The entire look of the theme can be easily changed through a lot of cool options provided with the Theme Customizer which allows you to edit the theme and preview your changes in real time. You can change colors, fonts & a lot of options in the layout. GoodWork includes a slightly modified version of the awesome Visual Composer for WordPress plugin, which allows you to build up your own pages with an incredible ease! There are lots of shortcodes available, and all of these provide many options for custom layouts of functionality. By combining everything available the possibilities are endless! You can build anything with this theme, whether you’re a seasoned web developer, a talented designer or even if you’re just starting out with WordPress. The sliders of this theme are based on the great Revolution Slider plugin, which is an outstanding slider creator by it’s own. But in this theme we’ve extended the slider, in order to make it better and more complex! There are three custom skins for the slider(one with short captions, one with large captions and one with tabs), there is the blank skin and there is a full width slider available. With GoodWork you can create unlimited portfolios with completely different settings. You can have four, three or two columns, there are two thumbnail styles, you can choose whether you want it to load via AJAX or in a traditional way, you can use images, slideshows & all kinds of videos easily, and each project can b created with custom shortcodes via the page builder. All thumbnails are automatically generated and cropped and you can even have sidebars! The blog is also unique in this theme, giving you the option to have a classical blog in a tumblr style, or go for a more modern look with posts that are loading via AJAX. All posts allow you to use images, galleries, videos or audio files in them. And the available shortcodes for displaying your blog feed are many. There are also cool page templates for all kinds of post archives available. All of these were created with the page builder and show only a glimpse of the great possibilities which can be achieved using this incredible theme! You can create as many sidebars as you wish, to use in each one of your pages. The sidebars can be either left sided or right sided and inside them you can use all the default WordPress widgets, or most of the awesome shortcodes available in the page builder. The menus can go up to three level of links, being optimized for touch devices and providing a responsive menu for small devices and screens. The responsive menu goes only two levels. The menu comes in two color styles (light or dark). As it can be seen, the theme offers a full width version and a boxed layout version. The boxed layout can have an image or a pattern as background and all the patterns & images seen in the preview are included in the download. 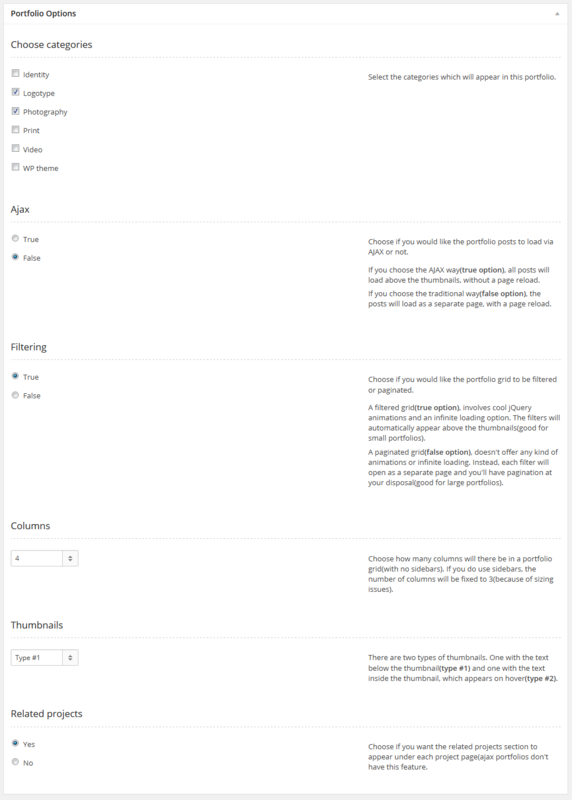 More than this, you can even upload your own background image or pattern. Even if the online demo is presented in an elegant Arial, the theme offers over 500 custom fonts via Google Fonts. There are types for headings, for italics and for the main body font. The theme is built with SEO in mind, having a good structure, heading elements for titles, alt tags for images and even smart meta descriptions, taken directly from the excerpts of the pages. The theme is built using the latest web development technologies, including HTML5 media content, CSS3 transitions, canvas elements and semantic & well organized code. A lot of PSD files are available in the download. With them, you can easily change layouts and stuff for presenting the perfect website for your clients! There is a comprehensive manual available and some quality screencasts which can help you get started with the theme and there is always the support forum backed by professionals caring for your business! The XML import file is available and can be used to download the demo content from the online preview(without the copyrighted images). The sliders still need to be setup, but this is a separate topic and files import files for the sliders are also available. This theme is constantly updated with new features & functionality patches making it a secure and incredibly useful investment for you or your clients. Att: The Visual Composer plugin needs to be updated manually! Disclaimer: All images, videos & audio files which you see in the online preview are copyrighted materials belonging to their authors (listed below). None of the assets you see online will be provided in the downloadable package!